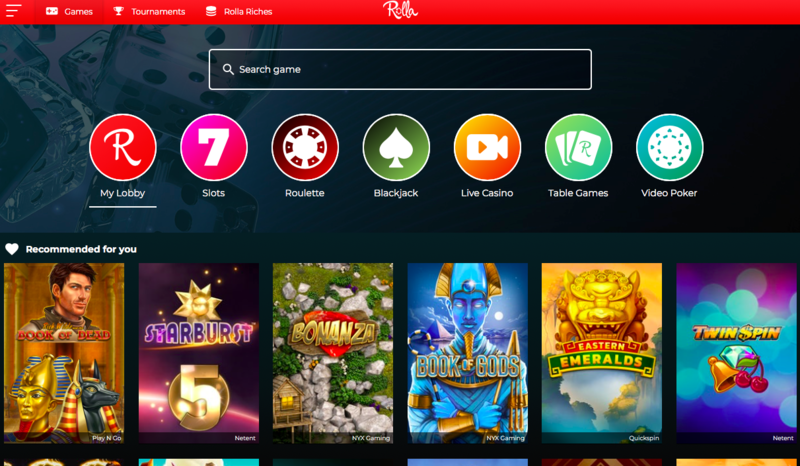 Rolla Casino sprung into the online casino world in late 2018 in what we all know is an overly subscribed and tough industry to make an impression and thrive in. With that said, it’s clear that any new online casino must stand out in some way to both attract and maintain players, who now have an overwhelming selection of choice. Some new online casinos will opt for the tried and tested method with obvious themes, layout and name choices, where others will go left field, with bold, unique designs and a name that gives no clue whatsoever to what may lay within. So where does Rolla Casino stand? Shall we begin with the name? I actually think they’ve been quite clever here. It’s nice not to hear another cliché casino name with the words ‘luck’, ‘vegas’ or ‘spin’ in the title, yet the word Rolla immediately brings the term ‘high roller’ to mind. The home page has a strong red and black design with a simple bar along the top with links to games, tournaments, Rolla riches and a drop-down menu, taking you to table games, video poker, live casino, roulette, slots and blackjack. Although the welcome bonus is displayed, on first impression, there doesn’t seem to be any theme as such; no pictures, previews or exciting graphics? This can be a little disappointing at first, but on further inspection, it becomes apparent why. Scroll further down the page and this is where you’ll see Rolla casino is a little different to other online casino sites. Firstly, you’re given information about creating your personalised dashboard which will be your easy access hub for your favourite games, missions, tournaments, balance and rewards, all on one place. A very convenient touch and the reason why the landing page seems a little lacklustre to begin with – once you’re signed up, you’ll create your own! Scroll further down and you’ll see a preview selection of slot games available along with the software providers, and below that is information about the tournaments which are extremely popular. At the bottom of the page is a section giving a glimpse into the missions you can undertake. Take on the special missions and you’ll earn rewards each week. You’ll need to sign up to get further information, but despite a lack of a bold, unique landing page, you’re certainly intrigued enough to want to sign up and find out more. There’s no doubt Rolla Casino has a fabulous selection of online slot games, over 500 to be precise. These come from the likes of NetEnt, NYX, Evolution and Microgaming, to name a few. And with this impressive list of software developers, you’ll find all the latest new release slots and classic titles to enjoy. They speak for themselves. However, it’s the tournaments and missions that are the biggest attraction for players. Daily tournaments allow players to have their points turned into prizes when they climb the leader board, and instead of a regular deposit welcome bonus, Rolla Casino have scrapped that totally, avoiding the bonus hunters and showing they’re keen to retain players. Instead, players will earn real cash bonuses and wager-free spins with their rewards. Most can also be used on the live casino, table and cards games as well as slots. Always be sure the check the rewards scheme on the site as they may change. Crediting your account is easy, with most major credit cards, neteller, bank transfer and EnterCash being accepted. You can play with Australian or Canadian Dollars, Euros or British Pounds, however you can only play in English at present. 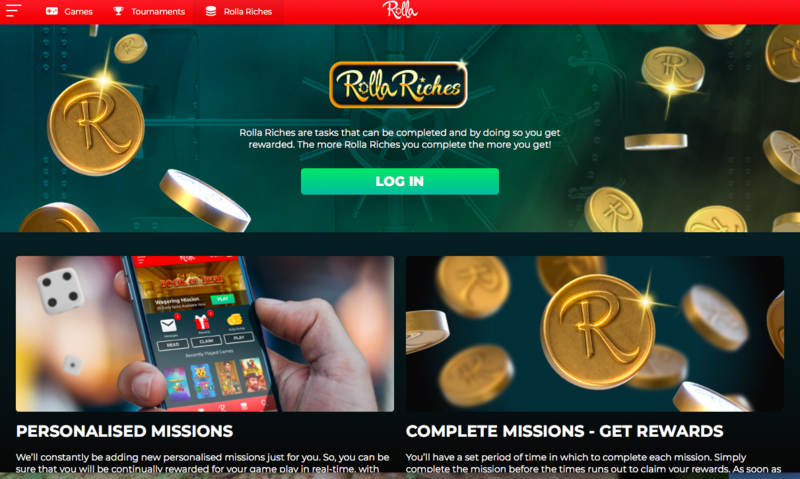 At Rolla Casino, the onus seems to be placed more on retaining players, missions, tournaments and playability, rather than an ‘in your face’ selection of slots screaming at you or extravagant new player offers. It’s a subtle but clever approach, which I think will be rewarded with loyal players and secure place in the industry.